Today I bring you the lovely, the sweet, my Canadian neighbor, Bruna of Bees With Honey! And I think having her write a TGIF post in the summer was exactly how it was meant to work out. Because, as you will see, this girl loves summer! TGIFS: Thank God it’s Finally Summer! I don’t know about anyone else or anywhere else, but the beginning of summer was long overdue here where I live in beautiful British Columbia, Canada. Now that it’s here, I’m in my glory and it’s because summer, to me, is like it being Friday every day for 10 full weeks. Summer, of course, is way longer than 10 weeks but once we’re back to school; summer is officially over even if the season still continues. You know what I mean? Back to work, back to reality. Some parents love summer break and others hate it. Some love having their children home for the long haul while other parents go bananas trying to keep them entertained and out of their hair. during the two month break from school and for oh so many reasons! being able to keep the kids up later at night and sleeping past 8am every morning. no mad rush to get anyone ready for school or work in the mornings including myself. no making lunches every night and laying out clothes for the next day. no homework to help with. BBQ dinners every night and dining out on our back deck. Sharing Corona’s, Bud-Light Limes, Sangria and margarita drinks with friends. sprinklers, slip and slides and swimming for the kids. weekend road trips to the USA to visit my husband’s family and friends. outlet mall shopping. Need I say more? time spent at my parent’s summer home in Birch Bay, Washington. wearing flip-flops, shorts and tank-tops and enjoying the wonderful warmth of the sun’s rays. beautifully, coloured and manicured toes. roasting marshmallows and making S’mores by the fire. taking photos of my family with my digital SLR Nikon camera and playing around with different settings and lenses. weekend getaways with just the hubby while grandparents watch our girls for us. lots of rest and relaxation! Summer is my favourite season of the year. I am truly at my happiest when the sun is shining, I am warm, surrounded by family and relaxed. 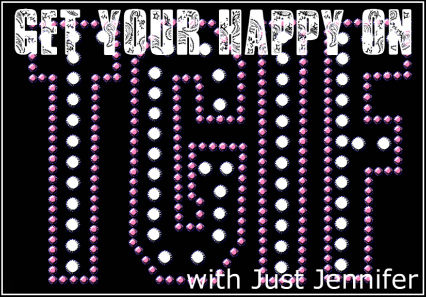 Thank you to Jennifer for having me as a guest on her blog. I feel honoured she invited me to share her bloggy space today. 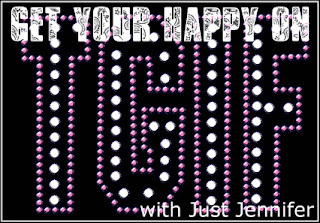 I love her TGIF meme and encourage all of you to link-up your happy every Friday. Tell all your friends about it too! I think I must agree with much of what Bruna has said here. While I think there are things to love about all the seasons, summer in the Pacific Northwest is just such a treat. Now I want to hear YOUR happy, so write, include the button, link! I LOOOOVE not having to help with homework and staying up later. It's wonderful, yes it is! Happy Summer, I say! Hurray for summer! I'm so glad it's finally graced us West Coasters with its presence. Here's hoping it decided to stay until September! We have been enjoying lazy mornings at my house too. Love your list, especially the Bud Lights, Coronas, etc. Down here in TX, we like Shiner Bock Ruby Redbird...beer with grapefruit juice in it. Sounds weird but really good and refreshing. That sounds yummy, actually. Beer and grapefruit juice. I'll have to try it! Your summer sounds fantastic!! Hope it goes exa fly like that without too many hitches. Enjoy!! Thank you Robot Mommy :) I'll enjoy every last minute of it. Oh my - I want to come spend the summer with you!! Such fun. I think this is true for most of Canada, since most of our year is cold and or snowy: we just get outside as much as possible as sun as the sun smiles on us. drinks on a back deck and smores is the perfect end to any day! Us Canadians savour every moment of summer, don't we? We see so much rain on the west coast, it's not even funny. I love summer for the same reason... I have the pleasant temps most of the year but only during those three months of June, July and August do we have a much more stress free life!!! A stress free life is good, isn't it? Too bad it wasn't like summer all year long. Thank you so much for inviting me to share your bloggy space today. It was fun. I love linking up with your weekly meme. Who doesn't like to get their happy on?